We love burgers! Especially homemade burgers. 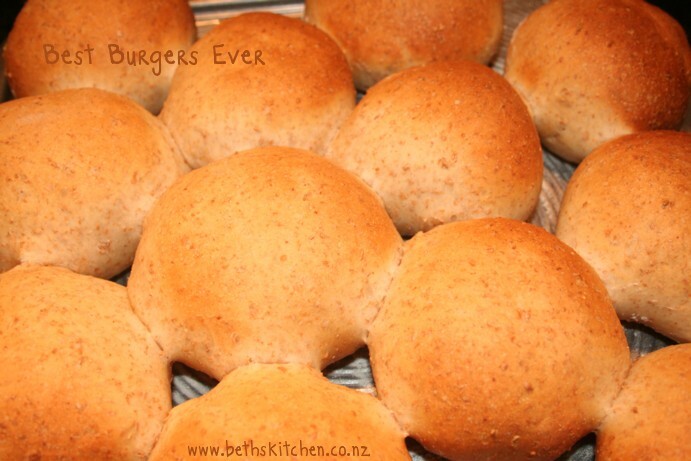 First thing I have to remember to make some fresh bread rolls, using my sourdough recipe – nothing like fresh bread for your burgers. 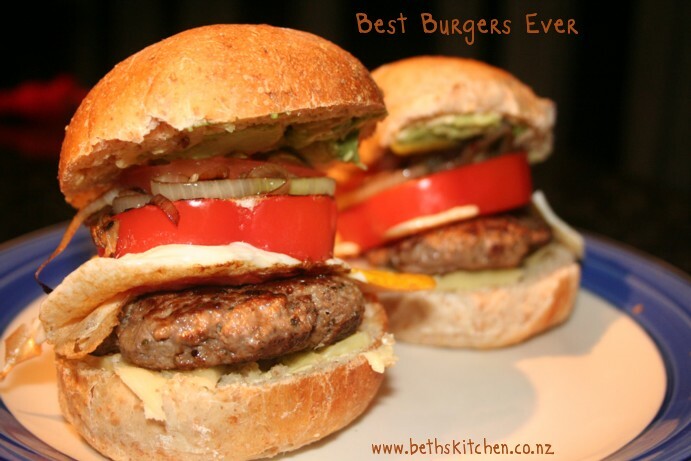 My favourite burger/meatball recipe is very easy: 1/3 each of lean beef mince, lamb mince and pork mince – the minced pork acts as a binder so there is no need to add egg or breadcrumbs. I then season with salt and pepper, some dried herbs, and liquid smoke. This is something I’ve recently discovered – gives the food a lovely flavour (as long as you don’t overuse it!). 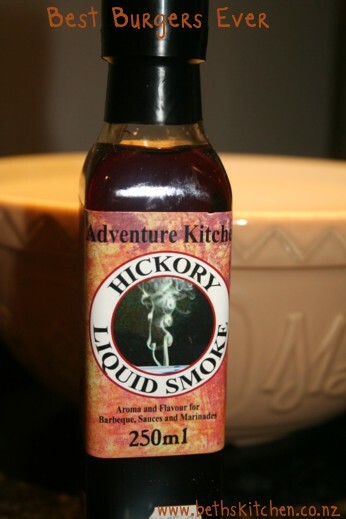 I use about 35ogm of meat with 1/4 tsp of liquid smoke. 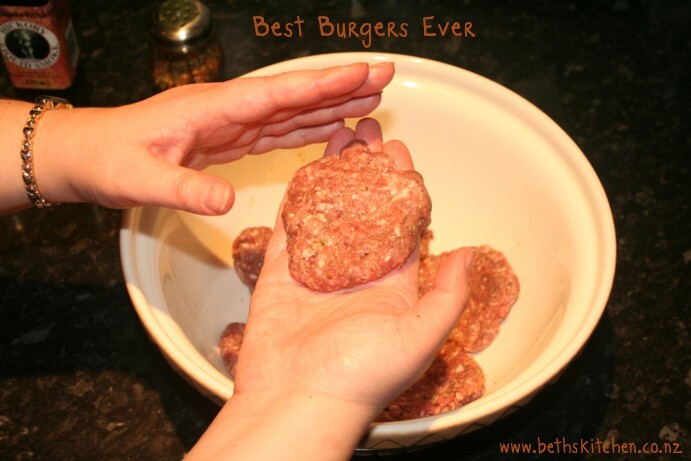 I mix everything with my hands, combining all the meats with the seasoning, then I split into even portions (6 portions for the above amount of meat), and shape into flat patties with my hands. I make the patties quite flat and shape with my hands. I recently saw Richard Blais making burgers and picked up two great tips from him: make your patties larger than your bread rolls, and stick some holes into the patty as it is cooking to release steam and stop them from becoming too ball-like. Both are great tips! I cook them in a hot frying pan, waiting until juices run clear and then get the out to rest. Meanwhile, The Sous Chef is prepping the other elements. To cook the eggs, he cut rings of capsicum, and then we use them as edible egg rings – cooking them on the flat-bed toasted sandwich maker! He also chops cheese, tomatoes, gherkins, avocado, onions and mushrooms. Then it is time to build, and eat these great burgers. Yum! 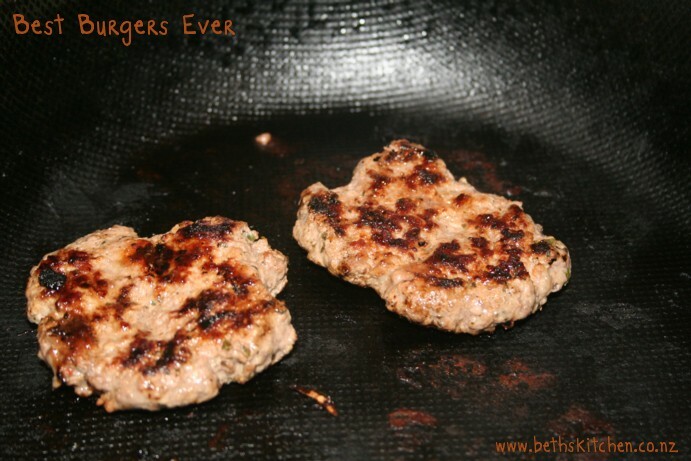 They are easy to make, and healthy with the homemade patties and bread – let me know if you give them a try.